A car emerges from the depths of the North Sea. The vehicle was one of dozens that sank into the sea when a cargo ship lost 291 containers in a storm off the northwestern coast of the Netherlands on January 2, 2019. Now a salvage operation to lift scores of shipping containers from the seabed has begun, about 20 kilometers north from the Dutch island Terschelling. Sjaco Pas of the Netherlands Coastguard says the endeavour could take months: " Depends on the weather, depends in the year, and then they lost maybe six containers, ten containers normally, but now it's a huge number of containers and it also took weeks or months. That's the difficulty of this operation." Two ships are being used to lift sunken containers to the surface. The vessels are equipped with a special sonar system that can detect objects on the sea bottom. The vessel's crane with attached gripper pulls out the car and drops it on the boat's deck. Next a crane also drags a broken container from the waves. 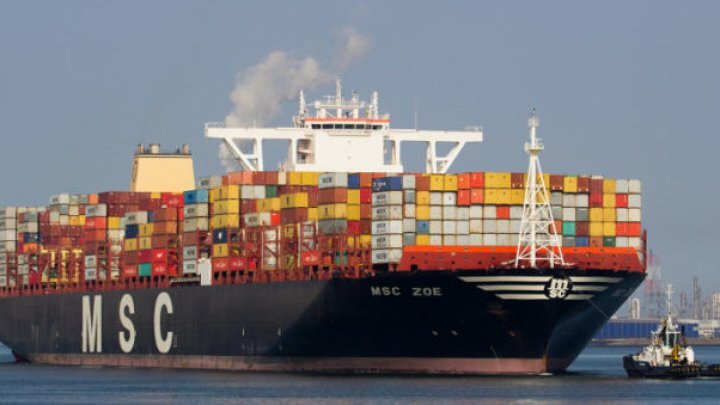 On January 2, the MSC Zoe, one of the world's biggest container ships, ran into trouble as it sailed from Portugal to the German port of Bremerhaven. A Netherlands Coastguard airplane recorded the incident. The footage shows the vessel losing containers, many of them already broken on board the ship. The lost cargo included cars, toys, light bulbs, and flat-screen TVs. Two containers contained closed-off barrels of an organic peroxide, a flammable and highly toxic compound. They belong of the group of 55 containers that have not yet been located. Officials in both Germany and Netherlands have warned the public to stay away from the containers after some items were washed up on beaches. The Dutch authorities said that one bag of peroxide had been washed ashore on Schiermonnikoog island on January 3. Conditions on the North Sea mean that it is not possible to employ divers explains Pas: "They don't use divers at this moment, they try to avoid that because it is also dangerous for divers as well, because you have a lot of current in the North Sea. Now they have a crane and a gripper and they collect all the garbage and part of the containers." The salvage team rely on sonar technology and traditional offshore vessels and techniques to locate the missing containers. The operation is taking place on a major shipping highway, a popular route for ships moving to west and north Europe. To avoid collisons the Dutch coast guard has deployed an extra vessel to ensure ships are aware of the salvage operation. The operation will continue both day and night and will last for several months.